This is Part 3 of a 4-part series. Click here to read the first in this series. A strategic addition to this agenda came into play in 1991. The National Welfare Grants (NWG) program announced a competition to fund CED related research as one of their priorities. Ironically, I never opened the envelope until 2 days before the closing date. I immediately got on the blower to Nancy Neamtan in Montreal and suggested that IFDÉC (who had organized the 1988 international conference) and CCE put in a joint proposal to research urban CED in Canada. I put together the proposal the next day and several weeks later we were awarded a research grant. 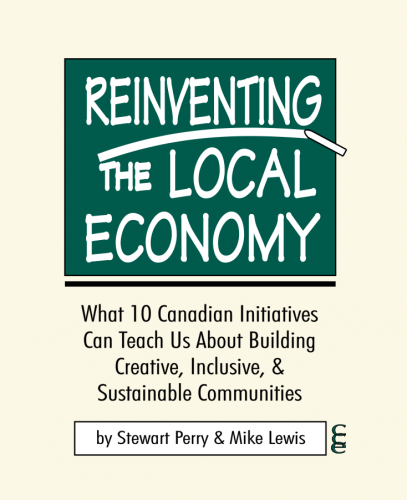 Many products came out of this project, the most well-known of which is the book “Reinventing the Local Economy” which Stewart Perry and I wrote. It was the first Canadian book to attempt to define what works, identify the characteristics of best practice, and to begin articulating what needed to happen in the policy arena if we were to leverage better results across the country. Just as important, the research became another organizing and networking device to advance the overall agenda. Making Waves was used to weave together all of this into a series of stories and case studies that got the word out to people who were not willing to wade through a major tome. NWG, a tiny but effective unit in the former federal department, Health and Welfare Canada, became an ongoing ally and source of support. Indeed, this tiny organization was perhaps my most positive experience of government actually playing a real partnership role. They listened, they thought strategically and they sought to build relationships focused on advancing the field. Without them, the work of building a national network would not be as far along as it is today. Guy Brethour and Evariste Theriault, the two key staff people with whom we liaised, became trusted partners. (Interestingly, Evariste, in the year 2000, was the last person in the department that carried the history of this period. He was instrumental in securing HRDC funding for CCEDNet's first National Policy Conference in March 2001). One of the major initiatives that NWG took under the leadership of Brethour was to organize a major symposium on CED out of which the book “Community Economic Development: Perspectives on Research and Policy” emerged. This event not only helped further the process of defining the field in Canada, it enabled many practitioners to come together for a full three days, a rare opportunity. At this Kananaskis summit, many of the people there, presenting papers and leading discussions, were among those that many years later would help found the Canadian CED Network. I remember well a hotel room meeting where a number of us thrashed around how we could leverage the small gains we had made thus far into something more significant and durable on a national scale. (My memory is fading but I distinctly remember Dal Brodhead, Bill Ninacs, Rankin MacSween, Flo Frank, Sandy Lockhart and Michael Swack being there). Not long after the symposium, Lloyd Axworthy, Minister of Human Resources Development Canada, announced the social security reform process, which was to include cross-country parliamentary committee hearings. (Lloyd had many years before been inspired by the Bedford Styvessant project in New York City, one of the largest CDCs in the US). The “reform” process provided the next platform for organizing. By this time, people were getting to know each other, although we were still fragile and fractured. Making Waves had been around for 5 years. CCE books and publications were getting out. Symposiums and independent research was happening. The work in Quebec was making huge strides. Many of us were being asked to speak at diverse forums – First Nations, governments at all levels, universities and even the Conference Board of Canada. I decided to approach Guy Brethour for some help in funding travel and meeting costs for what I framed as a national policy advisory group to CCE. The objective was twofold. The explicit purpose was to convene leading practitioners from across Canada to formulate a considered intervention in Axworthy’s “reform” agenda. This necessitated meeting, analysis, deliberation, consensus building and then communicating with and animating CED organizations to participate in the cross-country parliamentary hearings. The tacit objective was to finally have an opportunity for practitioners to work together at a common task of substantive public policy importance. In the process, I believed that the electricity created by so many talented, committed people coming together would galvanize people to take the big step of committing the time, energy and money needed to forge a national infrastructure. The strategy worked. Several national meetings were held involving about 35-40 people. Analysis was done collectively. Papers were prepared. Policy recommendations were formulated. Making Waves published the results. CCE stimulated CED organizations to get in front of the parliamentary committee right across the country. And, critical to our objectives, a small group was formed of people committed to do the work necessary to formally move towards establishing a Canadian network. Paul Born, then the Executive Director of the Community Opportunities Development Association (CODA) out of Cambridge, Ontario, took the lead to write an initial concept paper and not long after, working together with CCE, organized the first gathering held in 1997. The 16 organizations who committed funds, time, energy, sweat and a few tears to make this happen became the founding members of what initially became known as the Digby Network, (sometimes referred to as the Digby Dicks) but which eventually became incorporated in 1999 as the Canadian CED Network. By June of 2002, CCEDNet had grown to almost 200 members and was poised to hold the largest pan-Canadian CED conference ever held in Canada in Winnipeg the following September. There is one other stream to this historical snapshot that will be of interest to those curious about the evolution of the field. One of the elements in CCE’s mission is to develop more effective capacity for technical assistance. By 1995, we had done probably 600 projects that cut across most aspects of the field. The challenge as we saw it was how to build a system that would link respected, experienced providers of technical assistance into a network that could make quality technical assistance to emerging CED initiatives more financially accessible. We knew that building effective development organizations was difficult at the best of times and the right assistance at the right time could save a lot of heartache and help make more effective use of scarce resources. In 1995 and early 1996, CCE organized a network of people from Newfoundland to the Pacific who committed an annual budget of person days they were willing to contribute at a rate of $300/day. Meanwhile, the McConnell Family Foundation had new leadership in Tim Brodhead and were moving towards CED becoming part of their funding stream. We approached McConnell. They expressed an interest in hearing more about what we named the Social Economic and Employment Development Technical Assistance Program, or SEEDTAP for short. We submitted a proposal. The project officer came back to us asking for a market study to be done. He also explicitly expressed concern that CCE could well be in a conflict of interest position if it proceeded to be the vehicle through which such an initiative would take place. This just made me mad. Coupled with the workload we were all carrying, and being somewhat resentful - I somewhat immaturely interpreted the conflict of interest comment as a challenge to CCE’s integrity - we declined to undertake the market study. Nevertheless, this initiative was the seed from which the CEDTAP program housed at Carleton University emerged, a program for which CCE became one of many technical assistance providers from across Canada.